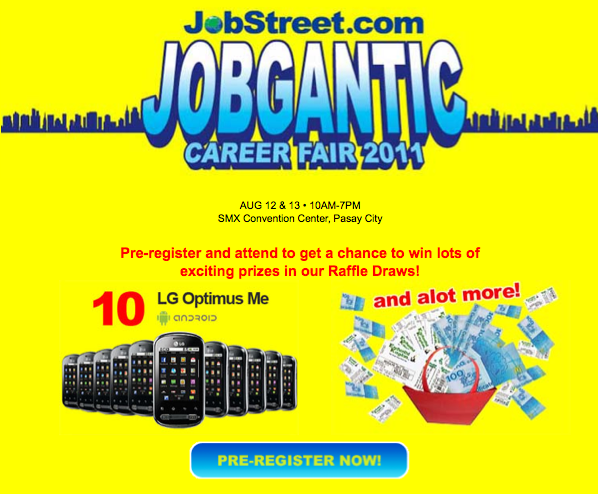 Jobstreet.com holds the Jobgantic Career Fair 2011 in SMX Convention Center on August 12-13, 2011. You need to pre-register at Jobstreet.com website to qualify for the raffle promo. The promo is valid only on those 2 specified days. 1. Log on to www.jobstreet.com click on Philippines and pre-register for the JobStreet.com Jobgantic Career Fair 2011 to qualify for the raffle promo. Registration is FREE. 2. Attend the Jobgantic Career Fair 2011 on August 12 or 13 at the SMX Convention Center, Pasay City. 3. Present the printed copy of the Fast Lane Voucher that has been emailed to you or show the SMS Event Reminder to any of the JobStreet.com queuing staff assigned within the SMX Perimeter for the job fair, in exchange for a raffle coupon. 4. Completely fill–out the required information on the coupon and submit this together with the Fast Lane voucher and/or SMS reminder at the Registration Counters of the job fair. JobStreet.com shall conduct three (3) raffle draws per day during the Jobgantic Career Fair 2011. These draws shall be in the presence of representatives from SMX, company sponsoring the Raffle Item, and JobStreet Marketing Executives. Winners shall be announced over the Public Address System. 1. All winners must claim their prize at the JS Information Booth until 6:30 PM only of August 12 and 13. 2. Winners shall be asked to present any valid ID as proof of identification. 3. In case the winner is no longer within the venue, he/ she will be contacted via phone or email on how to claim his/ her prize on or before August 15, 2011. 4. All prizes that have not been claimed by end of working hours (9:00AM-7:30PM) of October 14, 2011 shall be forfeited.